This Tuesday, Venus moves into Virgo (more on that later). Along with Wednesday’s New Moon in Virgo, we are advised to streamline, declutter, and ground ourselves. The mutable Earth sign of the zodiac, Virgo is all about being efficient + organised. Clean-ups are totally the hip thing to do during this lunar cycle: it’s a great time to eat clean, clear your work + living spaces, and/or commit yourself to a more eco-friendly lifestyle regime. What’s not hip: over-accessorising, clinging on to old/dysfunctional habits + patterns, using disposable plastics. Virgo is all about minimalist chic. Less is more. We’re also headed for the Equinox from 21-23 September (Autumn in the Northern hemisphere, Spring in the Southern), so do expect a significant shift in energies – Equinoxes are wonderful times to facilitate major inner changes that may not be visible to the casual observer (yet), but are profound, powerful, and absolutely necessary. Let’s get to This Week’s Tarot! 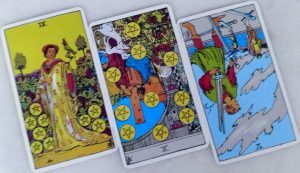 Regular readers will notice that this week’s deck is different! Yep, I was the resident Tarot reader for the Formula One Singapore Grand Prix 2017 last weekend. On the first day of the Grand Prix I gave a record-breaking SIXTY readings with my usual deck, a Morgan Greer. My poor darlings needed a break after that, so now I’m working with a (new) Rider Waite deck. Here we go! Venus is the planetary ruler of love, beauty, harmony, and partnerships – the Tarot asks us to consider what (and/or whom) we want in order that our lives be filled with love, joy and purpose. This is a Pentacles card, after all, so you can guess that the answer will have something to do with values and practicality. According to the Nine of Pentacles, the key to a beautiful life lies in working hard + smart. As a Number Nine card, the message is also about perseverance: you’re playing the long game, you’re in it to win it. MIDDLE: TEN OF PENTACLES REVERSED. How then, do we play the long game without losing our love for life and our inner harmony (very Venusian concerns)? The Ten of Pentacles is here to ask us how and where we’ve allowed our comfort zones to become our limitations. This card vibrates to the energy of a Ten, which represents culmination, completion, and (in its shadow aspect) too much of a good thing. It seemed right at first: to earn a million before you hit thirty. To marry that decent chap your parents liked so much. To purchase that expensive house that would require a huge loan. And, in order to pay off the loan, to get that well-paying job that would eventually consume your time, your life force, your happiness. Every path has its price. Could it be time to change the path you’re on before it ends in death? RIGHT: FIVE OF SWORDS REVERSED. Ooof. The Five of Swords, both upright and reversed, is never an easy card to get. When ill-dignified, the message of this card is to return to + reconnect with your authentic inner self. When you’re in touch in what you truly desire (and this brings us back full circle to the Nine of Pentacles, i.e. what you want out of life), it’s a lot easier to walk away from egocentric conflicts + pointless fights with inauthentic people. You’re in it to win it, you’re here for the long game, you don’t need to have the last word in the latest tiff with Useless Nancy from HR. Persevere, and focus on winning at life.